We are excited to welcome the month August! This particular time of the year always brings a lot of joy and feelings of national pride as we celebrate Indonesian Independence Day on 17thAugust. It has been 73 years since Indonesia claimed its freedom following centuries of colonial rule. At the Bali Dynasty Resort, we have organized an array of different activities to mark this special event, including a traditional Indonesian Food Festival or Pasar Senggol along with other fun pastimes for everyone to enjoy. Experience the celebrations of Indonesian Independence Day just like the local community! 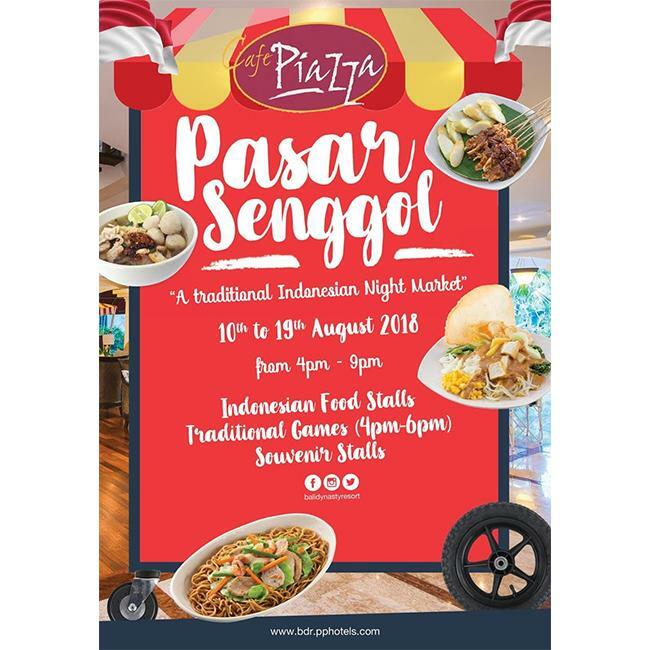 From 10th to 19th August 2018, Bali Dynasty Resort will be holding a traditional Indonesian Night Market or Pasar Senggol from 4pm to 9pm to spice things up in conjunction with Indonesia’s 73rd anniversary. Numerous food stalls, scheduled competitions and a variety of souvenir stalls will be available during the festival. The food stalls will offer traditional snacks and light bites known as “jajanan pasar”, as well as popular Indonesian dishes such as Mie Goreng, Gado Gado, Sate and Bakso. Meanwhile, colourful souvenir stalls will showcase a variety of local arts and crafts. Before sampling authentic Indonesian flavours, participate in some of the fun games and challenges organized by our Recreation Team from 4pm to 6pm. This ten-day event will take place at the Cafe Piazza, located at the lower lobby of the Bali Dynasty Resort. Don’t miss out on this locally-inspired experience!